Branwell Brontë died 168 years ago this weekend, on September 24th, 1848. His cause of death was listed as “chronic bronchitis and marasmus”, a polite way of saying he was a coughing, half-starved, alcoholic, laudanum-addicted wreck who finally, mercifully, proved unequal to the struggle of drawing breath. 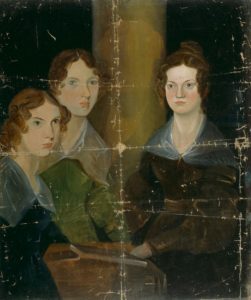 He lived just long enough to witness the first glimmering of what his sisters would become – Jane Eyre,Wuthering Heights and Agnes Grey were published in 1847, The Tenant of Wildfell Hall in 1848. This cannot have helped his condition. Once, too, Branwell had dreamed of becoming a celebrated author, but, like his other plan to set the world on fire as a renowned poet and portrait-painter, or to marry his one great love, his literary ambition had dissolved into the bottom of a brandy glass. Charlotte, Emily and Anne deliberately kept Branwell out of discussions about their work. They knew their success would choke him. Branwell was a coughing, half-starved, alcoholic, laudanum-addicted wreck who finally, mercifully, proved unequal to the struggle of drawing breath. They failed, however, to keep Branwell out of the legends that grew up after their deaths. He only published a few poems in his local newspapers during his lifetime, but Branwell’s name is forever associated with the nineteenth century classic novels written by his sisters. The Brontë label is a powerful one, conjuring up lowering skies, windswept moors, unbridled passion and haunting poetry. Although Emily, Anne and Charlotte’s novels are all unique, common threads run through all of the books. Theirs was the Romantic impulse at its most pure and intense. Readers couldn’t – and still can’t – get enough, but unfortunately the sisters died young and only produced a volume of poems and seven novels between them. However, Elizabeth Gaskell published herLife of Charlotte Brontë in 1857, whetting readers’ appetites for more dramatic, shocking stories not by the Brontës but about them. Gaskell inspired a slew of secondary texts, part fact, part fiction, about the sisters’ eccentric lives – and their supposed loves. It was impossible to spin yarns about Anne, Charlotte and Emily without including their brother, a controversial figure who loomed large on their collective horizon. And so Branwell became an integral part of the Brontë literary legacy. Unbelievable awesomeness – this looks like one literary adaptation they got right. Everyone’s least favourite celebrity pundit may find his own chickens coming home to roost. Welcome to MEDIAKNOWALL, for Media Studies students and teachers. Check out the sections below for notes and links to relevant sites, as well as a round-up of the latest media news stories. If you want information on a specific Media Studies topic, try the main search page.